CLASSIC Take a Guided City Walk to visit the Hradcany Castle Grounds; see St. Vitus Cathedral and Old Town’s Astronomical Clock. Begin your European vacation before your cruise with an overnight stay and sightseeing in Bucharest, including the Royal Palace Square and Romanian soldier remembrances. Embark on your Danube River cruise in Fetesti and begin in the Danube Delta at the Black Sea on a small-boat tour in the delta preserve. 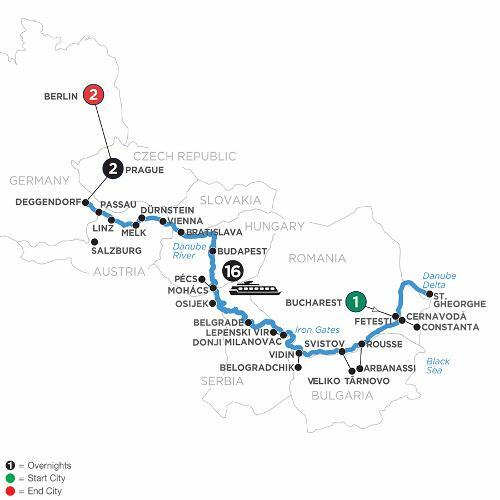 Celebrate Kilometer “0” to mark the Danube’s course of 2,845 kilometers. Cruise through Balkan landscapes, including Bulgaria’s largest inland port of Rousse and the capital of Veliko Târnovo. Visit one of the oldest towns in Bulgaria, Arbanassi. Visit Vidin and Belogradchik, and cruise through the narrow Iron Gates Gorge to visit Lepenski Vir. In Serbia, take a guided tour of Belgrade, and see the Croatian fortress in Osijek. Attend a performance by students of the Franjo Kuhac music school. Tour the historic town of Pécs, the Hungarian capital of Budapest, and Bratislava, Slovakia. Cruise to Vienna to explore the Habsburg Empire—including the Imperial Palace, Vienna Opera House, and St. Stephen’s Cathedral. Hear the tale of King Richard the Lionheart in Dürnstein, tour the magnificent Benedictine Abbey above Melk, and visit lovely Linz. Pass through the horseshoe bend on the Danube—the Schlögen Oxbow—on your way to Passau. Your cruise concludes in Deggendorf, Germany. Continue your vacation after your cruise with two nights each in Prague and Berlin! Discover the golden city of Prague—city of 100 spires, and the dynamic city of Berlin.